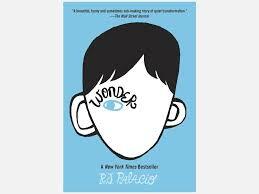 Wonder, a book about what happens when people treat each other with kindness. This year’s concept sprang from R.J. Palacio’s Wonder, a book about a 10-year-old boy named Auggie who suffers an unnamed facial deformity. Auggie’s painful story unfolds to reveal the wonder of human relationships when kindness is the lodestar guiding them. Because Auggie’s appearance invites stares and unpleasant reactions from strangers, his parents homeschool until 5th grade, when they decide it’s time for Auggie to face (literally) the world and his place in it. “The story resonated with her students,” says Ms. Hewett, “because although none of them have a deformity like Auggie’s, they all know what it’s like to confront and overcome obstacles.” Even during camp, situations arose that required students to think about how their words and actions were affecting others and choose a better, kinder way. Ms. Hewett’s camp has three precepts: One, be kind. Two, be kind. Three, be kind. To further deepen their understanding, they also integrated visual art as well as song and dance (“Wonder” by Natalie Merchant). The results were pretty amazing. Students really “got it,” so it’s no stretch to imagine that they will apply the lessons they have learned in their future daily interactions. In addition to acting, students also practiced the practical side of stagecraft. They were asked to “strike” and re-set the stage, as they performed scenes from Wonder in multiple settings—such as a school lunchroom and a forest. 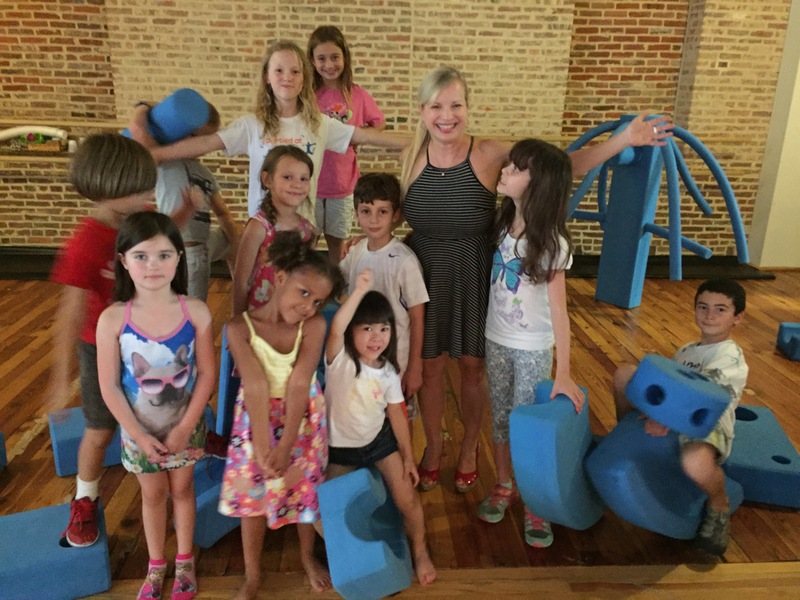 One of the most ingenious facets of Ms. Hewett’s theatre camp is how she uses what she has, something every good actor understands—they must be able to roll with it to keep a scene afloat. The show must go on. Another important point is that every role is critical to the show’s success. “Even if you’re in charge of turning on the lights or building sets or you’re the Lead Technical Artist, your contribution is essential to the performance” said Ms. Hewett. Thus, Ms. Hewett, with only 5 days to create, learn, rehearse, and outfit a play, used the TNCS Imagination Playground for props. Note how a cafeteria table becomes a tree in the forest. As always, theatre camp at TNCS is a wonder-ful thing. 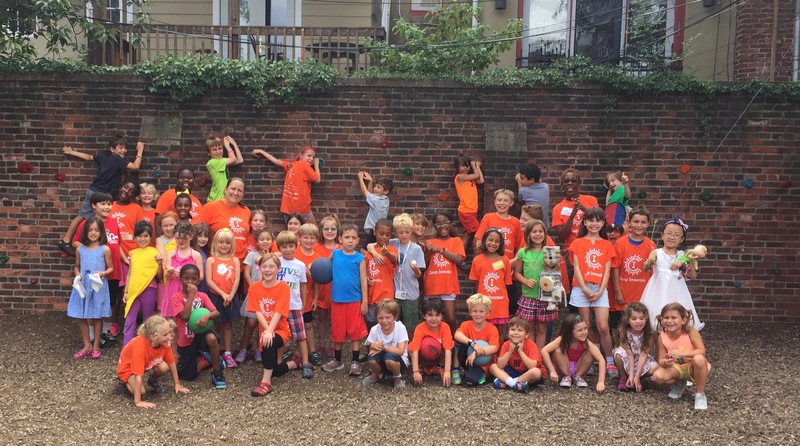 TNCS Camp Invention 2016 Is Epic! “This tessellation of hexagons represents he collective wisdom, experience, and insights of some of our nation’s greatest innovators, the Inductees of the National Inventors Hall of Fame. 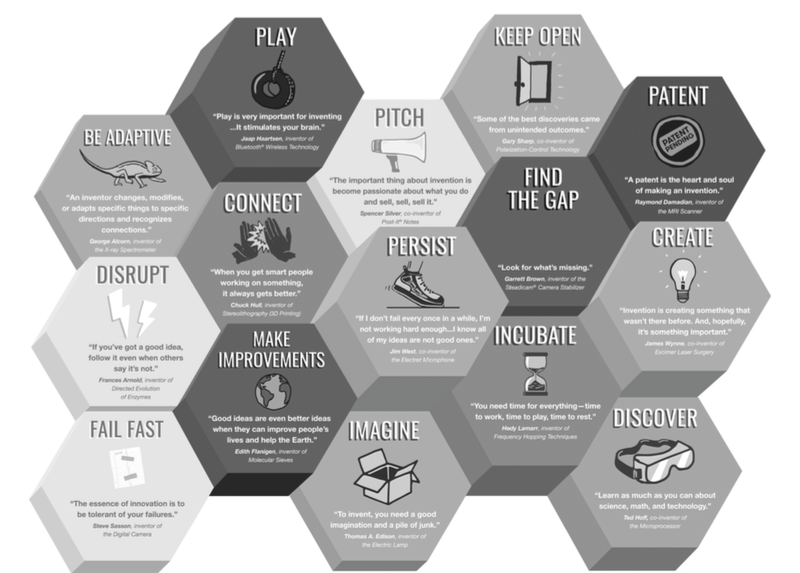 Each individual hexagon builds and strengthens the whole piece, just like each person’s invention contributes to the greater power of American ingenuity. For four summers running, The New Century School has hosted Camp Invention, a week-long day program and the brainchild of the National Inventors Hall of Fame in partnership with the United States Patent and Trademark Office. Presenting kids with real-world challenges that encourage them to solve problems and present their solutions through themed, scientific, engaging hands-on investigation, the Camp Invention program integrates four key components: 1) STEM enrichment, 2) consistent and effective implementation, 3) collaboration and other 21st-century skills, and 4) teacher and student development (read details here). Camp Invention adopts a new curriculum each summer to ensure that participants have a dynamic and memorable camp experience. This year, the theme was “Epic!,” and there’s no doubt that it was aptly named. Joining the TNCS campus for the first time were seasoned Camp Director Beth Allen and Co-Director Lynnette Haynes, who are teachers at Westchester Elementary School teachers in Catonsville as well as their Camp Counselor Morgan. 1. CrickoBotTM : Solar-powered robotic crickets are the name of the game! Campers created cricket-inspired inventions to outsmart motorized spider predators, build cricket-sized tire swings and trampolines, and explore the science of sound by investigating how crickets chirp. Friends challenged one another to Chirp-Offs, where they played their musical instrument inventions. 2. Epic ParkTM: Campers geared up and designed zip lines, water flumes, and hi-tech eco-gear! Ed Venture and Angel Investor needed their help to develop the latest and greatest tourist attraction because the dynamic duo just purchased Epic Park, located on a beautiful island filled with rainforest areas, waterfalls, sandy desert stretches, steep cliffs, and rolling hills that all lead down to the ocean. Angel and Ed—who happen to be crazy about all things adventurous—were looking for innovative thinkers to team up and pitch their most cutting-edge, green-energy designs for the future of Epic Park. 3. I Can Invent: Maker StudioTM: Campers repowered the motors, gears, lights, fans, and components found in broken machines to make their own innovations in the Maker Studio! For inspiration, they spun the Inventor Challenge Wheel to hear a video challenge from National Inventors Hall of Fame Inductees and Collegiate Inventors Competition Finalists and Winners. Everyone spent time exploring the science of 3D printing and tinkering with circuits to get their wheels turning in a new direction as they prepareed to make The Next Big Thing! 4. The Lab: Where Pigs FlyTM: Campers explored demolitions, coding, squid, slime, and sound-activated lights in The Lab: Where Pigs Fly and anything is possible! As scientists, programmers, and biologists, campers tested out a dozen or so experiments in the Camp Invention Laboratories. Each day brought exciting new challenges, from demolition and cup tower explosions, to programming and coding, to the chemistry of polymer slime and spinning disco ball circuits. Thus, each module intersected with and built on the others, resulting in kids really making the connection between what they were doing and why. As for inventions, they made robots (there were a lot of robots! ), a “homework helper” (a motorized pen to get that homework done faster!) and much (much—see photos for the state of the TNCS gymnasium during Camp Invention week!) more. Ms. Allen was excited that 2016 was the first year campers could integrate lights and motion in their creations. “Their prototypes didn’t always work out the way they expected, but the kids were so engaged in what they were doing and happy to see where their imaginations would take them,” she said. Now it’s our turn to get wet! These “butterflies” who flitted over from art camp watch from the wings. On the last day of camp, campers got to take their innovations home to enjoy. They also spent plenty of time outdoors, and even applied their physics and motion concepts on the playground in some Epic Water Battles! 1. What was the most exciting activity at camp? 2. What do you hope to do at next year’s Camp Invention program? 3. How can you create Camp Invention at home?